The global industrial control market for process manufacturing features players such as Emerson Electric Co., Mitsubishi Electric Corporation, Schneider Electric SA, Honeywell International Inc., Siemens AG, General Electric, Yokogawa Electric Corporation, ABB Ltd., Omron Corporation, and Rockwell Automation Inc. Of these, Siemens AG, Emerson Electric Co., ABB Ltd., and Schneider Electric SA dominate the moderately consolidated market, with a cumulative share of 48% in 2014. 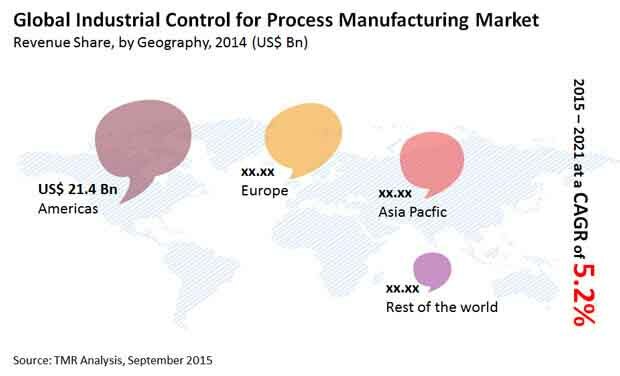 The competitive landscape of the global industrial control for process manufacturing market is likely to be marked by numerous acquisitions in the coming years, as the leading players attempt to expand. However, a steady focus on research and development is likely to remain vital in the industrial control for process manufacturing industry, as the expanding industry presents significant scope for even small companies who manage to achieve notable advances. According to Transparency Market Research, the global industrial control for process manufacturing market is expected to reach a valuation of US$96.2 bn by 2021. By technology, the global industrial control for process manufacturing market is segmented into manufacturing execution systems (MES), programmable logic controllers (PLC), distributed control systems (DCS), and supervisory control and data acquisition (SCADA). Of these, distributed control systems hold the dominant share in the global industrial control for process manufacturing market and are likely to remain the leading contributor in the coming years in spite of the segment’s relatively low CAGR. “The key ability of distributed control systems to control various divisions of a manufacturing unit from a central control unit is the primary driver for the segment”, explained TMR’s lead analyst. On the other hand, SCADA systems are likely to experience a steady rise in demand over the coming years. The key driver for SCADA systems is the rising awareness about their technological superiority over other types of industrial control systems. Geographically, the Americas are likely to remain the leading contributor to the global industrial control for process manufacturing market in the coming years. The rapid and smooth adoption of advanced industrial control systems in highly industrialized North American nations such as the U.S. and Canada is the leading driver for the Americas market for industrial control for process manufacturing. Due to this, the Americas are expected to account for a third of the global industrial control for process manufacturing market by the end of the 2015-2021 forecast period. Due to the demands of steady globalization, the industrial sector has laid strong emphasis on the uniformity of manufactured products. This has led to a rising demand from the industrial control for process manufacturing market, as manual monitoring of manufacturing is inherently less reliable than robotic control systems. The uniformity in product design helps manufacturers attain minimal wastage of materials, which is likely to ensure steady demand for industrial control for process manufacturing in the coming years. The rise in safety concerns in industrial units is also a key driver for the global industrial control for process manufacturing market. The emphasis on worker safety in the industrial sector could help maximize the favorable impact of this driver on the growth trajectory of the industrial control for process manufacturing market in the coming years. On the other hand, the market for industrial control for process manufacturing is facing significant concerns regarding stagnation in developed countries. While the market has promising prospects in emerging regions such as Asia Pacific, the Middle East, and Latin America in the coming years, the long-term usability of industrial control systems has resulted in a drop in new installations in developed regions such as North America and Western Europe.